Curtis is a D2 and serves as the Class of 2021 Wisconsin Dental Association Representative. Continue reading below to learn more about this year’s exciting Legislative Day in Madison, Wisconsin! 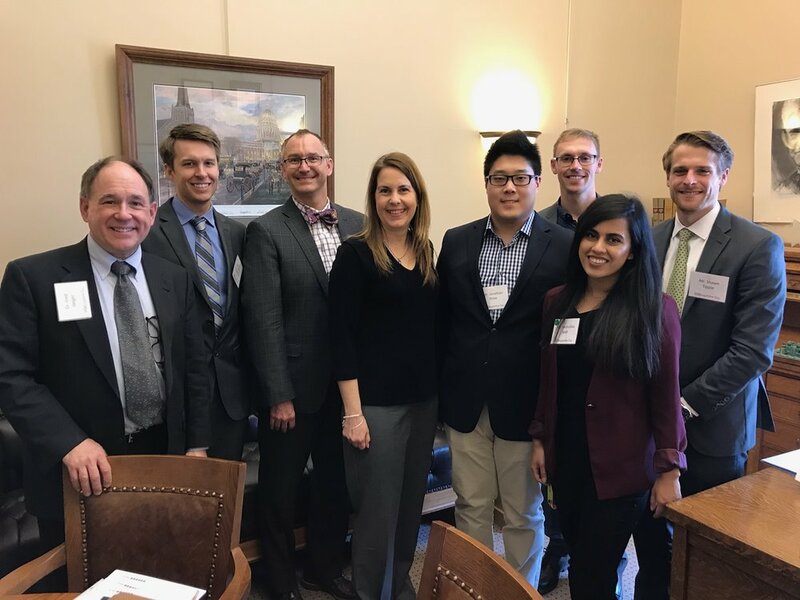 MADISON, WI – Wisconsin dentists and dental students from Marquette University School of Dentistry convened at the Capitol this past Tuesday for the Wisconsin Dental Association’s Annual Legislative Day. The event was an opportunity to discuss decisions impacting the dental profession and educate legislators on dental issues. Marquette dental students have been attending this event for several years. “It is so important for dental students to see advocacy in action and the impact that we can have as a group on our profession”, said WDA President Dr. Patrick Tepe. This legislative day was timely, considering newly-elected Governor Tony Evers administration’s budget proposal had a number of oral health initiatives, including more funding for safety net dental clinics and expanding the Seal-A-Smile program, which the WDA supports. Other proposals included adding dental therapists to the dental workforce and ending the Medicaid pilot program which increased reimbursements rates for select Wisconsin counties. The WDA opposes these initiatives. While not the sole focus of the day, the latter two initiatives dominated most of the conversation amongst the dental community and with legislators. As dental students, we all brought a varying degree of knowledge and awareness on these issues and in cases, our own opinions. As someone with a Master’s in Public Health and having worked on dental public health issues for several years, I received the Governor’s proposals as positive news; as it pertains to addressing dental access issues, a multi-pronged approach is required. I also fully understand that one suggested approach—dental therapy—is deeply unpopular with the vast majority of the dental community. My own view lies somewhere in the middle. While relatively new to the United States, dental therapists have been utilized worldwide for many years and have helped bring dental care to millions of underserved individuals. At its core, dental therapy can be effective if implemented properly, but arguing its merits are beyond the scope of this blog post. Nevertheless, what works for one may not work for another and it remains inconclusive whether dental therapy can work well in the American healthcare system. What is probably more concerning is that there are several flaws in the Wisconsin dental therapy proposal. Firstly, there is no stipulation that these newly trained therapists provide care to specific underserved populations (i.e., Medicaid and low-income). There is also no stipulation for therapists to practice in a rural community, a common requirement in other models. Secondly, it is unclear who would train these individuals and where the program would be housed. Marquette School of Dentistry has already made its position clear that it will not adopt a dental therapy program. In the past, claims have been made suggesting the quality of dental work performed by dental therapists is inferior to dentists; in fact, studies show the dental work of dental therapists is consistent with the quality of dentists. However, as a dental student, I do object to the short training process dental therapists go through. I am unaware of an equivalent healthcare provider with the scope of care and responsibilities of those of a dental therapist requiring only two-years of post-secondary education. If dental therapy is indeed an accepted model in the future, I would like to see a more comprehensive educational pathway that models the requirements of our colleagues in the medical community. We also learned that the Governor’s budget proposes ending the Medicaid pilot program in exchange for small statewide increases in reimbursements for dental services. These increases will be limited to non-profit clinics whose patient base comprise of at least 50 percent Medicaid patients, with the threshold being dropped to 5 percent Medicaid patients for private dental clinics. Though well-intentioned, the program will prove futile in its current form, as the reimbursement rate increase is so abysmally low, private practice dental providers will continue to face the same issue they do now—losing money by providing care to a Medicaid patient. In addition, discontinuing the program will put the providers from the pilot counties participating in Medicaid in a tough position with Medicaid patients they are now treating. The WDA advocates for a continuation of the pilot and continues to lobby legislators to increase Medicaid reimbursement rates to a level that allows dentists to break even with the cost of providing care. This stance is supported by a substantial body of evidence that increased Medicaid reimbursements increase the number of Medicaid dental providers, which in turn helps to increase access to care. Here, too, it’s important to note this is not a catch-all solution. We know we have a dentist distribution problem skewed heavily urban and that taking the dental care to the underserved areas works better than the reverse alternative. Proposals to increase Medicaid funding in addition to encouraging new dentists to practice in rural settings should be a legislative priority. Skeptics will be quick to point out that increasing rates has been an ongoing debate for decades and Wisconsin’s Medicaid reimbursement continues to rank as one of the lowest in the country. Advocates of the Medicaid expansion through the Affordable Care Act see the former as a crucial piece of the puzzle for better reimbursements, and Governor Evers has already indicated his desire to accept federal money for a Medicaid expansion. The WDA is on the record for supporting the expansion, but what will happen in the new administration remains to be seen. Overall, these are complex issues that do not have easy solutions and it can feel overwhelming at times navigating through it all. If nothing else, Legislative Day is an important reminder that we have to stay engaged. The past few years have seen the spotlight grow brighter on dental access issues, from major headlines to well-publicized books. Without full context, an outsider may question why he sees both dentist opposition to “access to care” proposals as well as a lack of access for millions of Americans. It might be easy to conclude dentists don’t care.